14K Solid Gold Three Stone Emerald and Diamond Ring. Classy yellow gold is sleekly sculpted into an extraordinary arching frame for 2 pristinely radiant, prong-set round diamonds and an enchanting round precious Emerald (measures 5.5 mm). Simple and brilliant extravagance to honor the one you love. Two round diamonds weigh 0.10 ct along with one round Emerald gemstone weighing 0.75 ct tw. 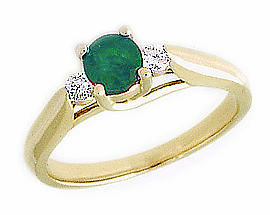 We guarantee our 14K Gold Three Stone Emerald and Diamond Ring to be high quality, authentic jewelry, as described above.